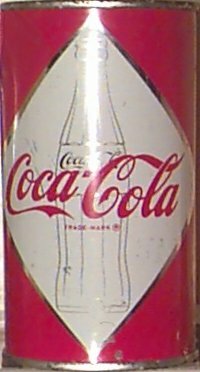 Although the idea for canning Coca Cola began in the 1930's, culminating with the creation of a 16oz and a 32 oz cone top can in 1936, no real progress was made until the 1950's. Neither of these cone tops appear to have actually gone into production, but were used as samples. 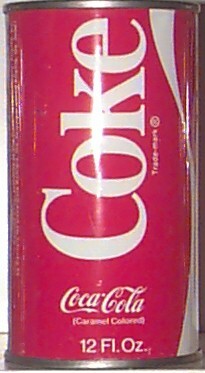 The only known Coke 32 ounce cone top! 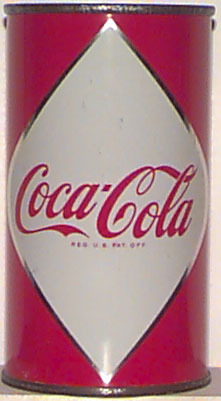 The first actual production can for Coke was a test market can which was produced out of the Hayward, CA plant for export to American Troups overseas in late 1955. 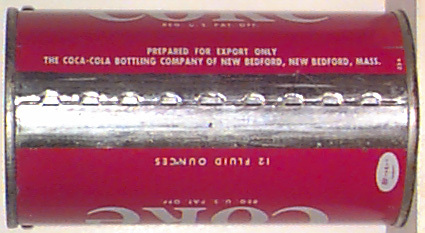 A second can from the New Bedford Mass plant for export to the American troops in the far east was produced in early 1956. The Hayward can is quite a bit more difficult to locate however. There is one tell tale identifier on this can which seperates it from the rest. 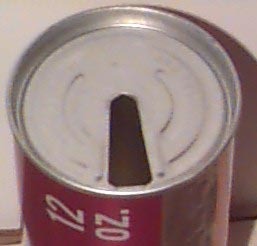 On the side of the can above the seam, the sentence "Prepared for export only" exists. This is an extremely tough can to find and even tougher to find in very good shape. 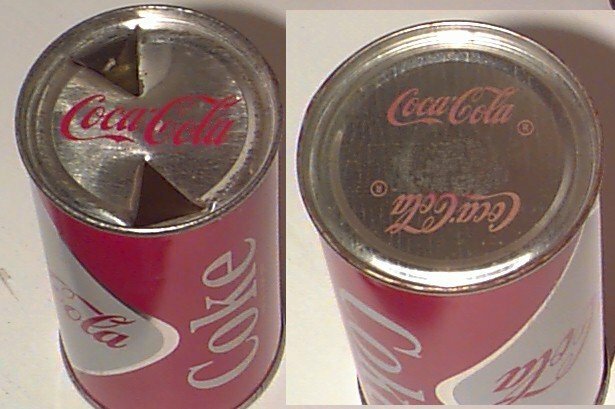 The other somewhat unique feature is in the lids that were used. 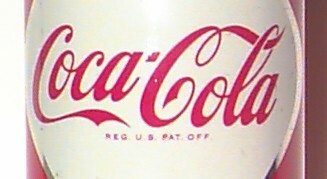 The original experimental lids did not have any production information, but rather had very plain & somewhat familiar Coke logo's. 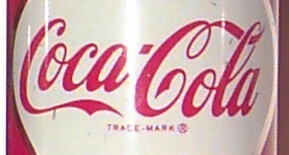 The primary reason for the test market being the military in the far east, was due to the question the Coke executives had about the taste of Coke in cans. It must have worked out well enough because later that year and in early 1956 a second test market can was attempted. The only difference that can had from the first was the removal of the "Prepared for export only" indicator above the seam. The common ground indicator that both of the two test market cans had that none of the later cans showed was the "REG. U.S. PAT. OFF." line below the Coca-Cola in the large diamond. 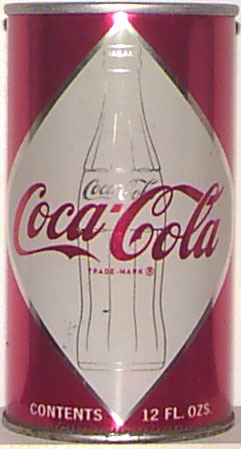 The first regular production Diamond can and all of the later Diamond with the bottle cans would have "TRADE MARK R" in its place. Both of the early test market cans extremely tough cans in good condition. That test did not last for two long a time before the executives decided thay weren't quite ready for the change to cans. 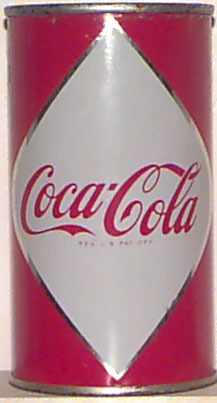 The success that other canners were having did force Coke to wake up and smell the syrup, so to speak, and they did introduce the first regular production can in 1960 to enter the national market. That final large diamond can is also a very desirable can today and can be pretty challenging to locate in high grade. 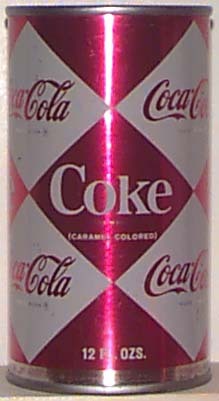 An interesting aside for the Coke collector that must have every can, in 1966, Coke test marketed a 16 oz version of the harlequin design from its Portland, OR plant. This is an extremely tough find and is considered a very rare can! 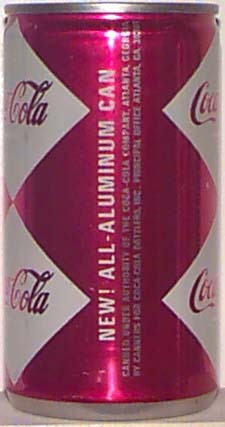 The first larger scale production 16 oz can came out in 1971 and was a dull version of the first spiral design from above with one content line. It is pretty tough to find! Another tough find is the only domestic 10 ounce can, from Gretna, LA in 1976. It's a very rare can that could easily be mistaken for a Canadian can. Although, the cans pictured are not for sale, I periodically do have some traders that I will use to add missing cans to my collection. 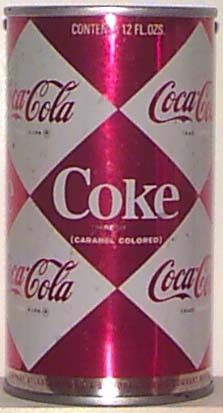 I am most interested in early flat top and cone top soda cans in high grade. All rights reserved. No images or information may be reproduced without the written consent of the author. Please contact me with questions.